Volatile organic compounds (VOCs) evaporate easily in the air but they help suppress a deer hunter's worst enemy - smells. And that science of deer hunting may soon help researchers develop a life-saving device for diabetes patients, according to a paper at the latest National Meeting of the American Chemical Society (ACS). By figuring out the best way to collect and analyze VOCs from body and breath odor, the researchers are going to develop VOC detection that can diagnose and monitor disease. That's where deer hunting comes in. It isn't just pest control that pays for state biologists and wildlife conservation, it's science. "The scent of a single person is a complex mixture of hundreds of compounds given off by bacteria, which live in our bodies and on our skin," said graduate student Shamitha Dissanayake of Mississippi State University, who gave the presentation. Scent compounds also come from the human body itself when it breaks down molecules to make energy. The odors are emitted through the skin and breath. Bronson Strickland, Ph.D. was studying odor-reducing products geared toward deer hunters and they teamed up. "The hunting community, the deer hunters in this case, are always looking for ways to beat the deer, so to speak, in terms of scent control," Strickland said. 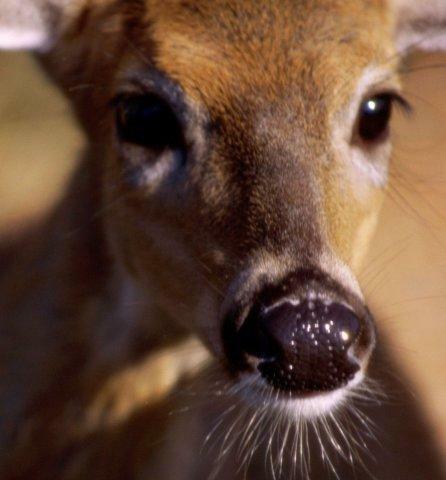 "A deer's sense of smell, like a dog's, can be anywhere from five hundred to a thousand times more acute than a human's." Figuring out which specific ingredients of body odor spook deer is a tall order, Dissanayake said. Not only does each person give off a unique scent, but that scent varies depending on when someone eats, drinks, exercises and rests. To begin to address this challenge, he collected body odor samples from 65 subjects. Over four hours, they either wore an untreated T-shirt or a T-shirt treated with a commercial spray designed to eliminate or mask a hunter's body odor — a task once accomplished with natural products such as skunk urine. The researchers tested a total of four products out of dozens on the market. "It was a big challenge to handle such a complex data set with so many variables," he said. So, after collecting the body odor samples, Dissanayake recruited the help of a mathematician to tailor a data-crunching program for their needs. Based on his analysis of the subjects' hundreds of VOCs, Dissanayake figured out that the sprays worked by greatly reducing the levels of 29 key compounds, either by killing the responsible bacteria, binding to the chemicals or converting them into less volatile compounds. To further narrow down the list, the next research step would entail seeing how deer react to these 29 candidates. The techniques and analytical instruments the team used to look for deer-alerting odors overlap significantly with their methods in another area of the lab's research: diabetes alert dogs. Formerly known as juvenile diabetes, type 1 diabetes is a condition in which the body doesn't make insulin. An estimated 3 million people in the U.S. may have the disease. When patients' blood sugar rises or falls, they emit a different set of VOCs in their breath. Animal trainers have figured out how to get canines to sniff out changes in blood sugar levels, which can cause a number of symptoms including seizures. Specially trained dogs' keen senses of smell have already saved some patients hundreds of trips to the hospital. But dogs are expensive, require a lot of care, and they get tired. Enter Dissanayake and Mlsna. They hope to translate their work into a portable electronic nose to do the dogs' critical job tirelessly, 24-7. "It's exciting to work in this field," Mlsna said. "We now have the combination of the analytical power and the computing power to really make sense of all these complicated data."